The renowned 18th-century French nobleman, the Marquis de Lafayette, has occupied a special place in the hearts of Americans for over 200 years. Born in 1757 to wealth and privilege, at the age of twenty he willingly sacrificed all in support of the American revolutionary cause. Defying his family and the French authorities, in 1777 he crossed the Atlantic with about a dozen men to offer his services to the Continental Congress. With the assistance of Benjamin Franklin, then ambassador to France, Lafayette secured a commission as a Major General in the Continental Army. Serving bravely and unfailingly at Brandywine, Valley Forge and Yorktown, Lafayette soon formed a singular relationship with his Commander in Chief, General George Washing-ton. The two men achieved a lasting bond usually reserved for a father and son. Lafayette's Revolutionary War exploits and his effort in inducing the French government to sign a treaty of alliance with the colonies in 1778 earned him enduring fame and respect on both sides of the Atlantic. In 1784, the State of Maryland bestowed citizenship upon Lafayette and his descendants (one descendant invoked this privilege in 1934), and in 1824, while on a grand tour of the United States accompanied by his son George Washington Lafayette, Congress bestowed on him the ultimate American gift for a retired hero - land in Florida and $200,000 in cash. America's friendship with France would remain steadfast from that time forward, and in 1886, France expressed the depth of this special relationship with its gift to the United States of the Statue of Liberty. When the United States was invited to participate in the Paris Exposition of 1900, Lafayette was still very much a part of the American psyche. The U.S. thought a fitting contribution would be a monument to the Revolutionary War hero for the city of Paris. It was decided that a statue of Lafayette on horseback would be sculpted by Paul Wayland Bartlett and displayed at the Exposition. A novel and educational approach was used to raise funds for the statue: School children from all over the nation contributed small change to the Lafayette Monument Fund. Raising nearly $50,000 during the campaign, they also learned much about the Revolutionary War and the part played by General Lafayette. More money was to come from the sale, at $2 each, of the 50,000 Lafayette commemorative dollar coins authorized by Congress on March 3, 1899. 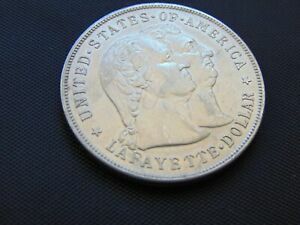 The Lafayette Memorial Commission originally requested that 100,000 half dollars be minted, but it later decided that dollars would make better souvenirs. 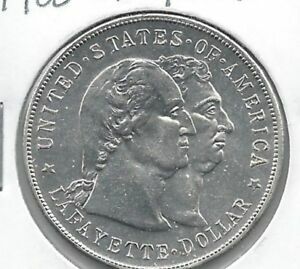 Congress intended that the coins would honor not only the Paris Exposition and Lafayette, but also the centennial of George Washington's death. 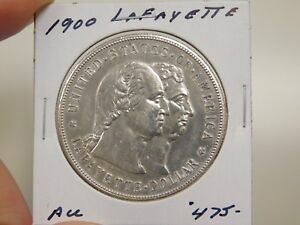 As it turned out, all of the Lafayette dollars were struck in a single day, December 14, 1899, exactly 100 years to the day after Washington's final hours. Die preparation for the coin fell to the Mint's Chief Engraver, Charles E. Barber. 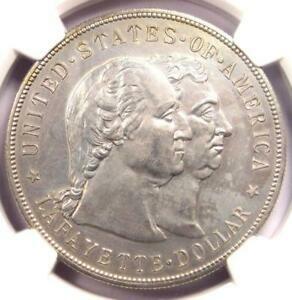 Barber's typical lack of creative artistry undoubtedly played a part in his selection of the motif: His obverse bore a striking similarity to a design fashioned in 1881 by medalist Peter L. Krider for the Yorktown Centennial medal. It features conjoined busts of Washington and Lafayette and has its roots in even earlier creations: Washington's likeness was borrowed from a bust by Jean Antoine Houdon created in 1785 - the same bust later used by John Flanagan as inspiration for his Washington quarter of 1932. 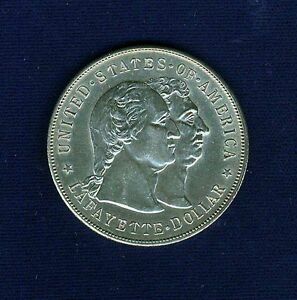 Lafayette's portrait was taken from an 1824 French medal by Caunois. 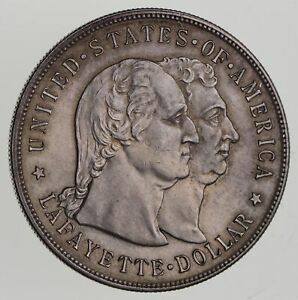 On the Lafayette dollar, the legend UNITED STATES OF AMERICA arcs above the busts at the rim, and the inscription LAFAYETTE DOLLAR arcs at the border below. 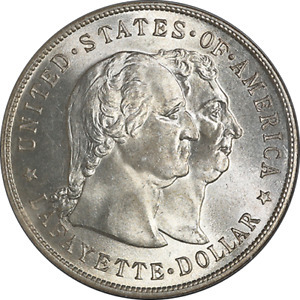 Barber's reverse design depicts Bartlett's statue of Lafayette, but as it appeared in the proposed plaster model: A number of changes were subsequently made to the bronze statue, which in 1908 was placed in the Place du Carrousel, adjacent to the Louvre. On the Lafayette dollar, Bartlett's name appears on the base of the statue. Encircling the border is the inscription ERECTED BY THE YOUTH OF THE UNITED STATES IN HONOR OF GEN LAFAYETTE PARIS 1900. 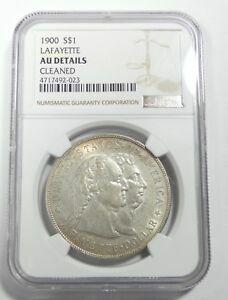 Although the date 1900 appears as part of the inscription, the coin was minted in 1899. Treasury officials side-stepped regulations which prohibited using a date other than the date of coinage by declaring that "1900" was part of the legend and referred only to the year of the Paris Exposition. 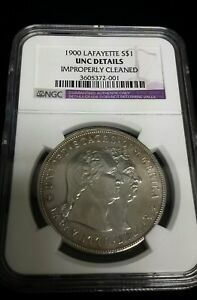 Technically, this coin is not dated. 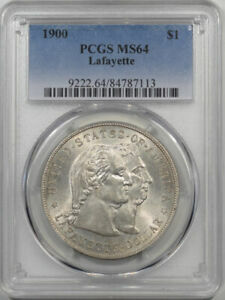 The Philadelphia Mint struck 50,000 Lafayette dollars, along with 26 additional pieces reserved for assay. Research has uncovered five different die varieties, from a combination of three obverse and four reverse dies. Collectors have shown little enthusiasm for the rarer die combinations, however, preventing any great pricing differential. Noted commemorative specialist Anthony Swiatek reports the existence of at least one brilliant proof, said to be one of ten such pieces struck. 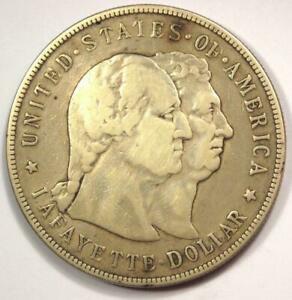 The Lafayette Commission refused an offer of $5,000 for the first coin to leave the dies: That first strike had already been earmarked for delivery to President McKinley, who planned to present it to President Loubet of France. Encased in an elaborate chest costing an astonishing $1,000, the coin was shipped across the Atlantic on the S. S. Champagne. It was delivered to the French President on March 3, 1900 in a special ceremony held in the Elysee Palace. 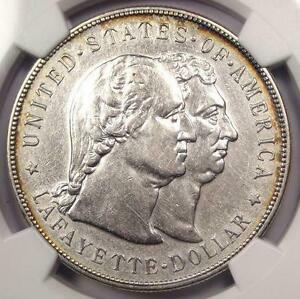 Lafayette dollars proved to be slow sellers. After the Exposition and for a number of years later they were readily available at less than the $2 issue price, often for just above face value. Many ended up in circulation. Ultimately, 14,000 pieces remained unsold and were returned to the Mint where they were stored, unknown to collectors, for almost 45 years. Sometime in 1945, they were melted into bullion. 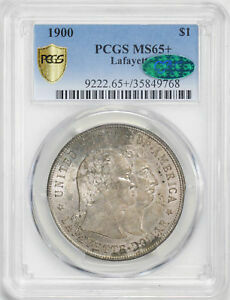 Although commemorative coins were never intended to circulate, many non-numismatists (who made up the bulk of the initial buyers of the Lafayette issue) often enjoyed polishing their treasures or using them as pocket pieces. 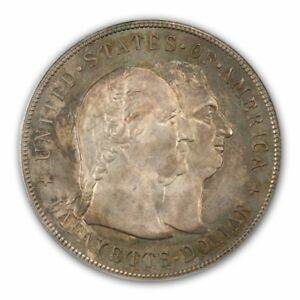 The large, heavy dollars easily acquired contact marks and abrasions and frequently suffered abuse from actual wear, as the coins' low collector value caused many to enter the channels of commerce. As a result, relatively few choice examples survive: most specimens encountered will range from AU to the lower levels of Mint State. Such pieces will often appear dull and lackluster. Higher grade examples, particularly MS-65 and above, are especially elusive. 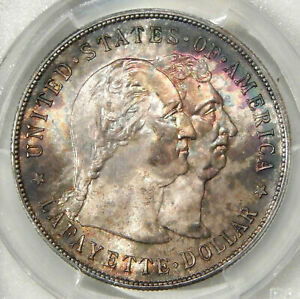 Truly uncirculated specimens will exhibit bright to dull satiny surfaces, although some semi-prooflike pieces do exist. 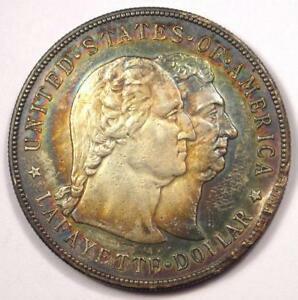 Evidence of wear first appears on Washington's cheekbone and on Lafayette's lower curls. On the reverse, check the highest points of the design - the boot, thigh and rear leg of the horse. These areas often come weakly struck and are prone to bag marks, cuts and abrasions. Forgeries exist: known counterfeits have grainy surfaces and exhibit raised spikes or tooling marks above the words STATES and THE in the inscription. 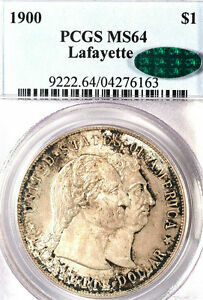 Check also for similar tooling marks on the reverse, below the letter "L" of Lafayette. 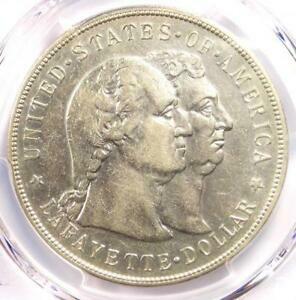 Today, in marked contrast to when it was issued, the Lafayette dollar is actively sought by type collectors, dollar collectors and of course, those assembling sets of U.S. commemorative coins. 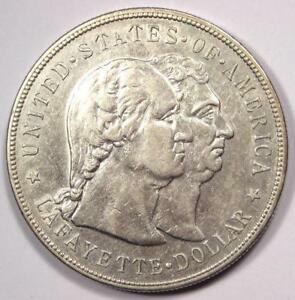 As the first commemorative dollar, the first officially issued coin to depict a former President, and the first coin to show the same person (Lafayette) on both sides, the Lafayette dollar will always hold a unique place in numismatics.